Kevin O’Toole presided over the land-based satellite casino bidding process in January and February of 2018. During its September meeting, the Pennsylvania Gaming Control Board (PGCB) approved online gambling licenses to SugarHouse Casino in Philadelphia and Penn National Gaming’s Hollywood Casino. The two new license holders brings the total of approved Pennsylvania interactive gaming licenses to five, as Mount Airy, Parx Casino, and Harrah’s Philadelphia all received licenses in previous months. Of the thirteen casino operators in the state, eleven have applied for online casino and poker site licenses. Only Lady Luck Casino and Meadows Casino have not applied for an online gambling license. Penn National Gaming owns Meadows Casino, so it appears that Penn National has decided to focus its marketing resources on a Hollywood Online Casino. Churchill Downs is in the process of buying Lady Luck, which has complicated the licensing process for that casino. Churchill Downs announced the acquisition of Lady Luck after Pennsylvania legalized online casinos and poker sites, so one would think that interactive gaming was a part of the thought process in buying Lady Luck. Due to the way Pennsylvania’s online gambling law was written, the state allowed for up to 13 licenses for each interactive gaming category: online slots, online table games, and online peer-to-peer (poker) licenses. As it is, 32 of the 39 total licenses have been reserved by land-based Pennsylvania casinos. That leaves 7 more licenses to be approved. Presque Isle Downs chose not to apply for the online poker license. That leaves three online poker licenses, two online slots permits, and two online table games permits in the state. The Pennsylvania GCB is not sure if all seven of those licenses will sell to in-state operators, so it has opened the door to out-of-state operators. 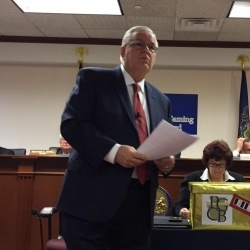 The Pennsyvlania Gaming Control Board approved Kevin O’Toole’s motion to proceed with the new out-of-state guidelines, which opened a new potential licensing process. Interactive gaming license applications will be accepted between October 15 and October 30. Any applications filed will go into a box. Those applications will be drawn at random via public drawing at the end of the licensing period. Any operator selected will be given 60 days from the drawing to submit their online gaming application. If that qualified gaming entity (QGE) chooses not to pay the price and submit their application, the process moves on to the next QGE. Pennsylvania’s online gambling laws were signed into law by Gov. Tom Wolf in October 2017 to generate $200 million a year in tax revenue, so the state’s officials are determined to get the full price for their interactive gaming permits. Like the land-based satellite casino bidding, not all of Pennsylvania’s gaming operators participated. The PGCB discussed opening up bidding for the satellite casinos either to out of state gaming operators or in-state non-gaming developers, but never took that step. Pennsylvania’s leaders chose not to do so because of concerns about saturation of the gaming market. The placement process for the land-based casinos was complicated enough that Las Vegas Sands Corp had one winning bid disallowed, because LVS put its proposed satellite casino in the verge of a competitor’s 25-mile radius. That caused Las Vegas Sands to stop bidding, and the satellite casino process came to a stop soon after. The opening of gaming licenses to out of state operators creates a number of interesting possibilities. Atlantic City casinos like Hard Rock Atlantic City, Ocean Resort Casino, or Golden Nugget might bid. Foxwoods Casino, MGM Resorts, or Wynn Resorts all might file licenses, though none have business interests in the state. MGM Resorts sought to buy the Sands Bethlehem at one time for $1.3 billion and it has a major operator in an adjacent state in the MGM National Harbor, so that major Las Vegas casino company might have interest in a Pennsylvania gaming license. Such a license might be a foot in the door to build a Pennsylvania customer database for the MGM Springfield or the MGM National Harbor, or it might be a chance to get to know Pennsylvania’s gaming officials and lawmakers.